* For Long Reach Mode applicable models, please refer to DIGITAL LINK page. * For applicable models, please refer to DIGITAL LINK Compatible Equipment page. * The output setting for the ET-YFB200G should be set to AUTO. This scaling/resizing function does not support some formats. The ET-YFB200G features two DIGITAL LINK outputs, allowing simultaneous delivery of media and control signals to dual projectors, two displays, or one projector and one display. 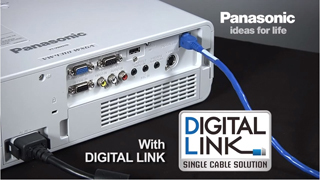 Dual DIGITAL LINK OUT is ideal for use in auditoriums, lecture theaters, and seminar rooms using primary and	sub displays, as well as for dual-unit projection in large venues such as places of worship, outdoor and indoor	entertainment events, etc. 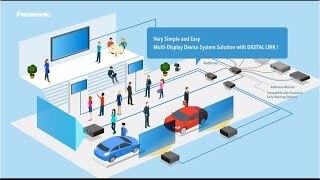 In applications where more than two display devices need to be integrated into an AV network, multiple ET-YFB200Gs can be daisy-chained (cascaded) via DVI-D to switch and relay signals to multiple displays using DIGITAL LINK. Suited to multiple projector installations for major outdoor or indoor sporting, entertainment, or corporate events including full 360-degree panorama capability. 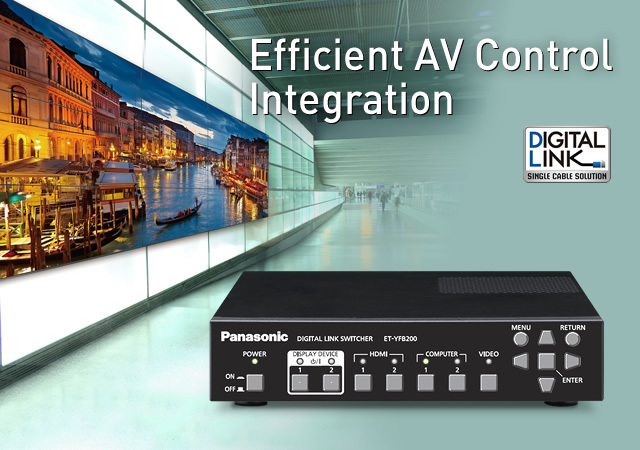 Ideal for simplifying and expanding large-scale AV networks in education facilities, large corporate offices, etc. The ET-YFB200G is an optional component in Panasonic's end-to-end video-wall solutions, which include a dedicated modular mounting frame, auto color calibration with camera, and panel daisy chaining via DIGITAL LINK. for sporting/entertainment events, and for use in transit hubs or retail spaces. 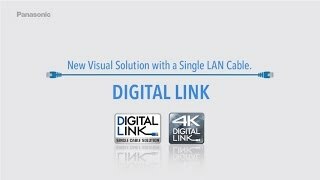 * Due to HDCP limitations, a maximum of eight displays can be daisy-chained via a single LAN cable.